Asian stocks finished mostly lower on Thursday as investors fretted about slowing Chinese growth and the impact of rising U.S. interest rates. Treasury yields edged higher and the dollar firmed up after minutes of the Federal Reserve’s latest monetary policy meeting showed broad consensus for further interest rate hikes on the back of robust economic growth and strong labor market conditions. Chinese markets succumbed to heavy selling as core lending data disappointed and the yuan hit its weakest level in almost two years, testing the government’s ability to maintain financial stability amid slowing economic growth. The benchmark Shanghai Composite Index plummeted 75.20 points or 2.9 percent to 2,486.42 amid fears that the trade dispute with the U.S. might escalate further. Hong Kong’s Hang Seng Index closed marginally lower at 25,454.55. Separately, the Trump administration moved to withdraw from an international treaty on postal rates in a move aimed at pressuring Beijing. Japanese shares fell in view of hawkish minutes from the U.S. Federal Reserve’s last policy meeting and weak exports data. Heavy selling in the Chinese markets also dented sentiment. 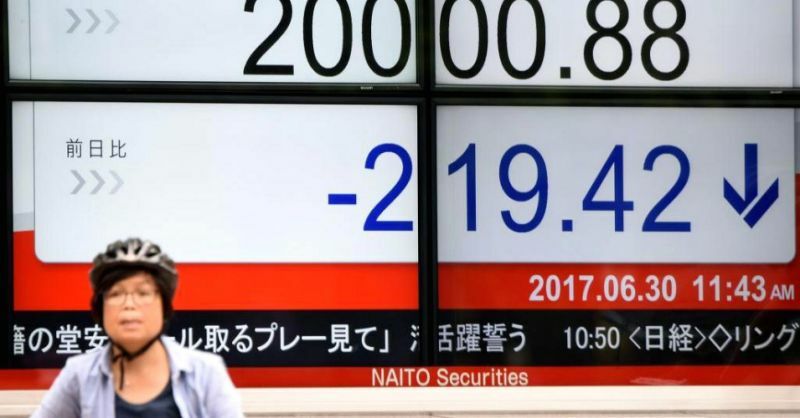 The Nikkei 225 Index fell 182.96 points or 0.8 percent to 22,658.16, while the broader Topix Index closed 0.5 percent lower at 1,704.64. Hitachi Construction Machinery lost 2.5 percent, Fanuc slumped 4.1 percent and Murata manufacturing dropped 1.9 percent after data showed Japanese exports fell in September for the first time since 2016. Rising U.S. yields helped lift financials, with Mitsubishi UFJ Financial Group gaining 0.4 percent and T&D Holdings adding 0.7 percent. Inpex and Japan Petroleum both fell around 2 percent after crude oil prices tumbled 3 percent overnight. Meanwhile, Australian stocks rebounded from early losses to finish marginally higher after data showed the country’s unemployment rate dropped to 5 percent last month, the lowest level since April of 2012. The benchmark S&P-ASX 200 Index and the broader All Ordinaries Index ended slightly higher at 5,942.40 and 6,050.10, respectively. Woodside Petroleum shed 0.8 percent despite the company reporting a 25 percent increase in third quarter revenue. Likewise, Santos eased 0.3 percent despite reporting a nearly 23 percent increase in third quarter revenue. The big four banks rose between 0.3 percent and half a percent. Mining giant Rio Tinto gained 0.4 percent and smaller rival Fortescue Metals Group soared 4.5 percent.